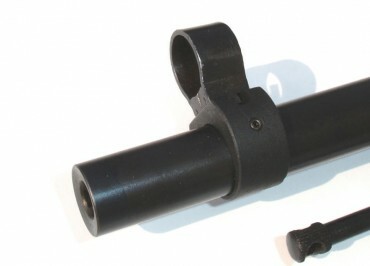 Well the guys at TGR/Brass Stacker are at it again, seeing a need in the Mosin Nagant community for a way to reinstall the front site on a rifle after the barrel has been cut down the good folks at TGR came up with the their “Steel Front Site Ring Adapter” Model number 090-004. The unit is CNC Machined from solid Steel not aluminum or plastic and has set screws to hold the unit firmly on the barrel. This is a great way to be able to keep using you original front site. This also allows for a more “authentic” look for say someone who wants to build a carbine version like a M91/59 or just a shortened “Scout” rifle. Made in the USA, it comes with a lifetime warranty and with a price under 20.00 US it’s a great deal! So as you can see they’ve done the Mosin nagant family another great service here giving the Modders out there something else to build their “Ultimate” Mosin with. Great Job guys keep em coming! Who knows maybe I’ll buy a rifle that’s been counter bored so I can try one. I would like to see them build an adapter plate or another version so you could use other off the shelve sites or fiber optic sites (but that’s me dreaming again).